This will be mine, only cos it is local to me. 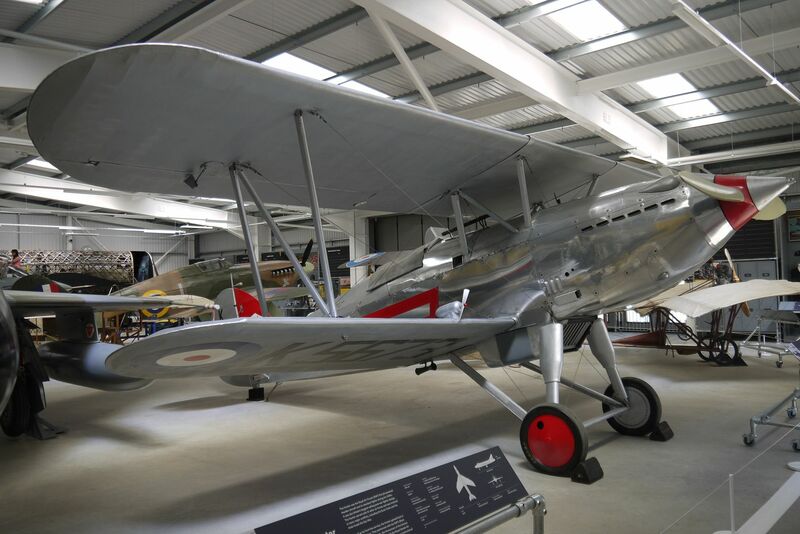 The Hawker Fury fighter was designed and built by H.G. Hawker Engineering Ltd, (renamed Hawker Aircraft Ltd in 1933) in Canbury Park Road, Kingston on Thames. Chief Designer, Sydney Camm (later Sir Sydney Camm, CBE, FRAeS), joined the company in 1923, was appointed Chief Designer in 1925, Director of Hawker Aircraft Ltd in 1935 and Chief Engineer in 1959. He died in March 1966. The Hawker Fury was renowned for its elegant lines and powered by a Rolls-Royce Kestrel engine (the forerunner of the Merlin). It was the first frontline aircraft in the Royal Air Force capable of exceeding 200 mph in level flight. Later variants were the High Speed Fury II and the Nimrod Fleet Fighter supplied to the Fleet Air Arm from 1932. The prototype, built by Hawker as a private venture and first named ‘Hornet’, made its first flight in March 1929 flown by ‘George’ Bulman. Fury production began in 1931 and 118 RAF Fury Is were made. Another 31 Fury Is were exported. This is a replica (BAPC 249) of a Hawker Fury I built by Hawker Aircraft Ltd, in late 1935, as part of the 5th production batch. It was assembled in the Hawker Flight sheds on the south west side of Brooklands. The original K5673 was delivered in early 1936 to No. 1 Squadron, RAF, where it was flown by the ‘A Flight’ Commander (whose colours and markings this exhibit now bears). In 1938, K5673 moved to No. 3 Flying Training School, but was ‘written off’ in a landing accident at RAF South Cerney on 7th December. The replica is externally accurate but for cost and convenience, it has wooden (not metal) struts and the internal structure differs from the original. The fuselage structure is geometrically the same, but instead of steel tubing with bolted/riveted joints, riveted light alloy channel extrusions (surplus Wellington geodetic material) are used. Construction of this replica was the ambition of the late Robin Balmer, MBE, FRAeS, C.Eng., who retired as Chief Designer of the Harrier GR3 at British Aerospace Kingston, where he was once a senior Project Engineer under Sir Sydney Camm. Robin was responsible for funding this project and also produced many drawings in the absence of most of the originals. DATA: One 525hp Rolls-Royce Kestrel; wing span 30ft (9.2m); length 26ft 8in (8.1m); height 10ft 2in (3.1m); wing area 252 sq.ft. (23.4sq.m. ); weight (empty) 2,623 lbs. (11,89.81kg); weight (loaded) 3,490 lbs. (1,542kg); max. speed 207 mph at 1,400ft. (331 kph at 4,267m); range 305 miles (408km). Good idea Tony, great subject and a good write-up. The Fury was based on the Hornet that Hawker first flew in I think 1928 and looked the same, also with the RR Kestrel. For production it was slightly altered and the name changed to Fury. That would make an interesting version as well because it isn’t well known. Pictures are hard to find. Plans ordered and i will be hand cutting all my parts. i expect some Depron will find it's way into my model as will some 3d printed parts. tissue and silk for covering. very complicated, very very complicated. but i can see where some Depron can be usted to try and lighten the modlel. so that should upset the purists. 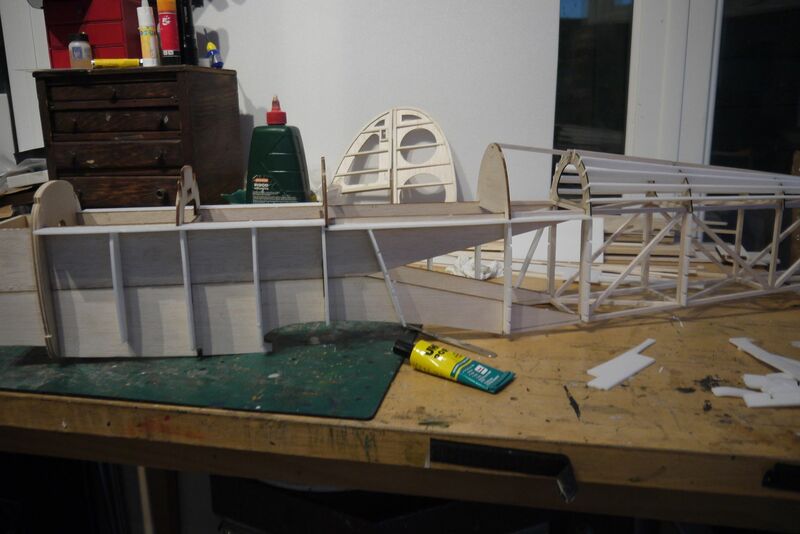 Well like Danny (the master) Fenton i have started with the fin and rudder. i have struggled a bit with understanding the plans, but i think i am getting there. it is a lot different to how i design depron models, so i am having to re learn the art of plan reading. need to build the other side when the glue has dried. not sure on what hinges to use, i expect mylar ones as the core is very thin. 1 articles Nice subject Tony and that looks a nice neat start. One thing, I think you have the rudder backwards? 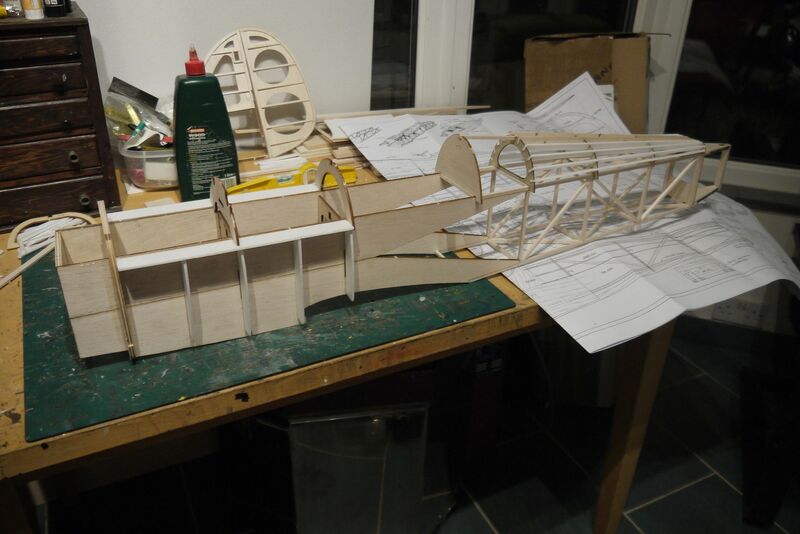 all built and ready for sanding tomorrow...i hope. 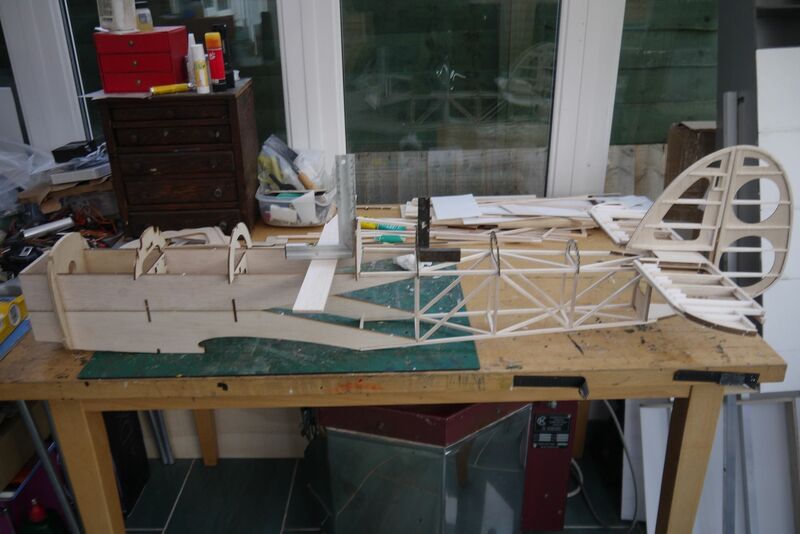 Another interesting project, you too have got the Bi-plane bug, and what a beauty she is too. 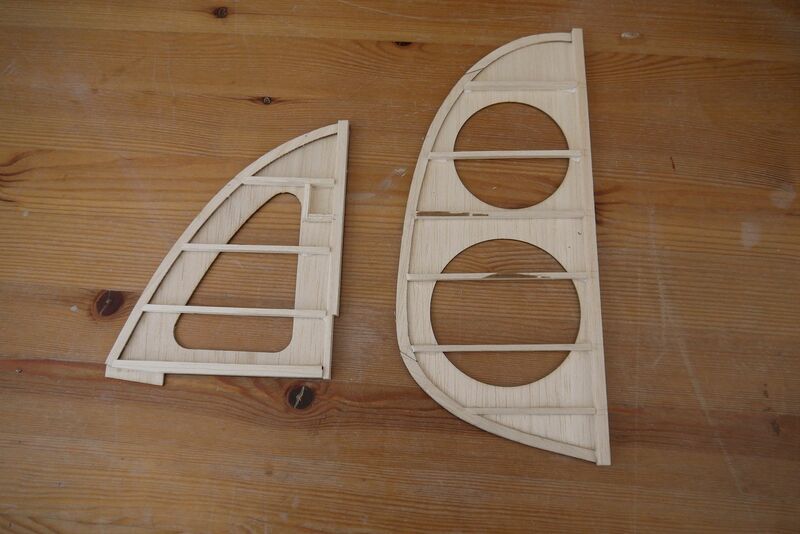 Fin and rudder sanded to profile, mine has come out slightly heavier than Danny's at 16gm complete. hmmmm. 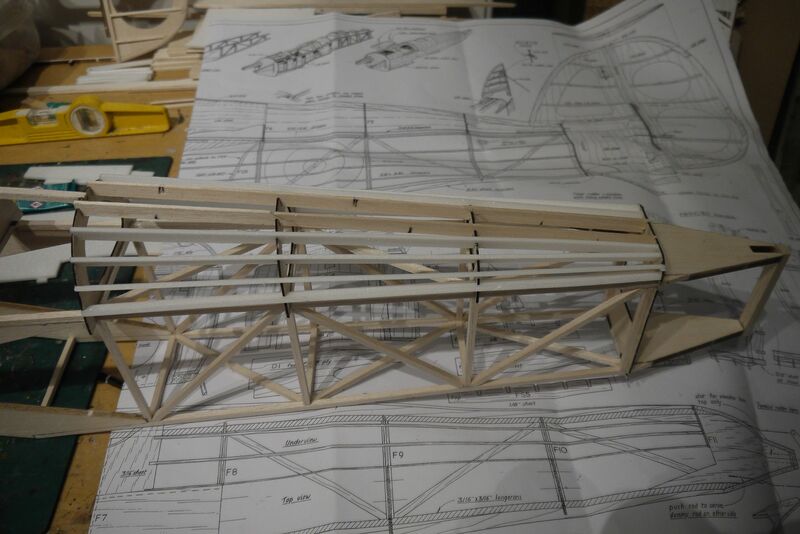 must have used slightly heavier balsa. 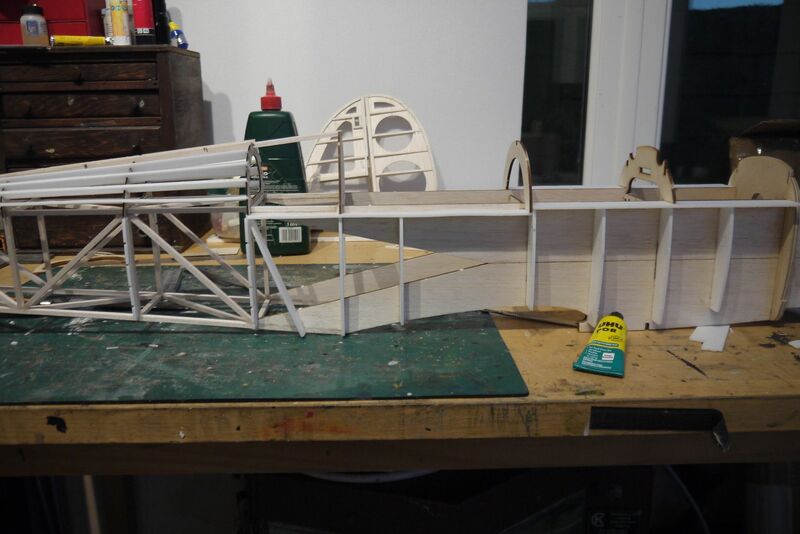 glued the fuselage halves together, well the inner box anyway, they will need to be lightened by cutting some holes i feel. 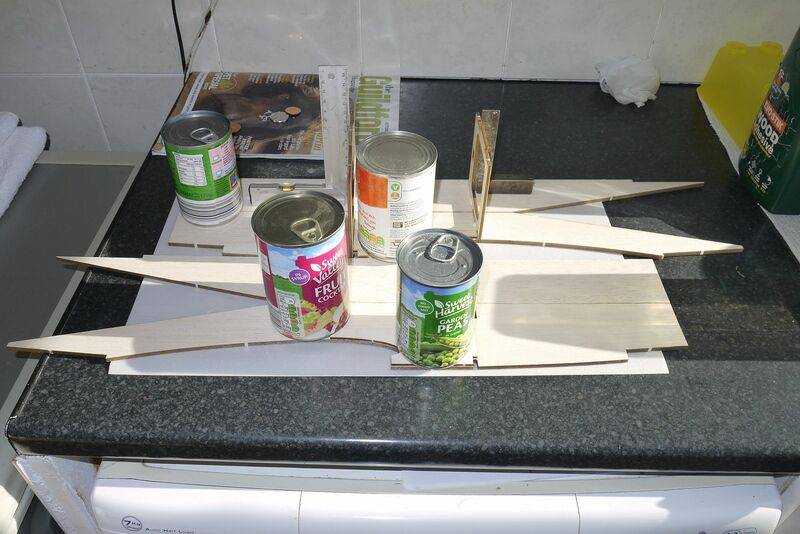 so using the left over 3/16th balsa i cut the longerons out and have started adding the first couple. 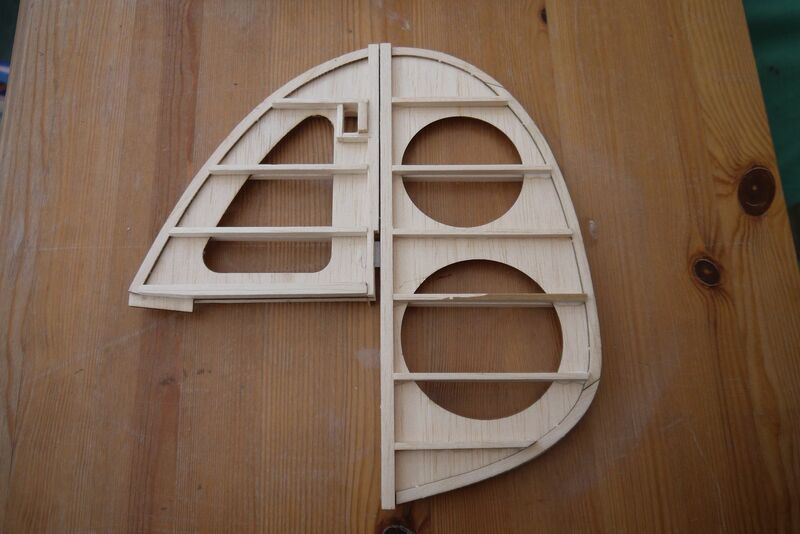 i am going to sheet the front of my fuselage with 3mm Depron as 3/16th inner box with 1/8th outer skin seems a bit ott to me. 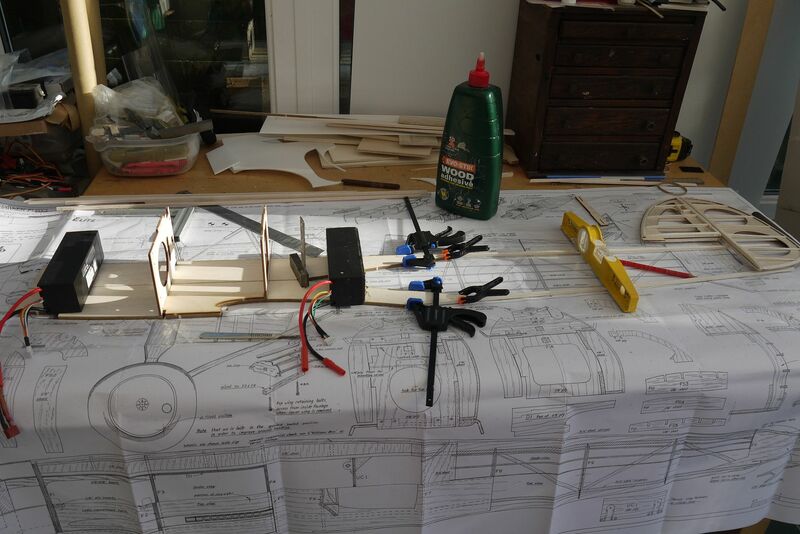 well i have got this far with the fuselage and am now strugging to understand the plans. the full size doublers go in the front section of the fuselge and slide into F1, they will need notching at the top rear to clear F2. my formers F5 and F6 have the notches where they glue into the fuselage cut wider than they show on the plan. the formers are the right size, i will just have to add some packing to fill the gaps. well F1, ply doublers and motor mount fitted. upper formers F3,5,7,8,9,10 and 11 fitted, F6 needs to be re cut as it is the wrong size. 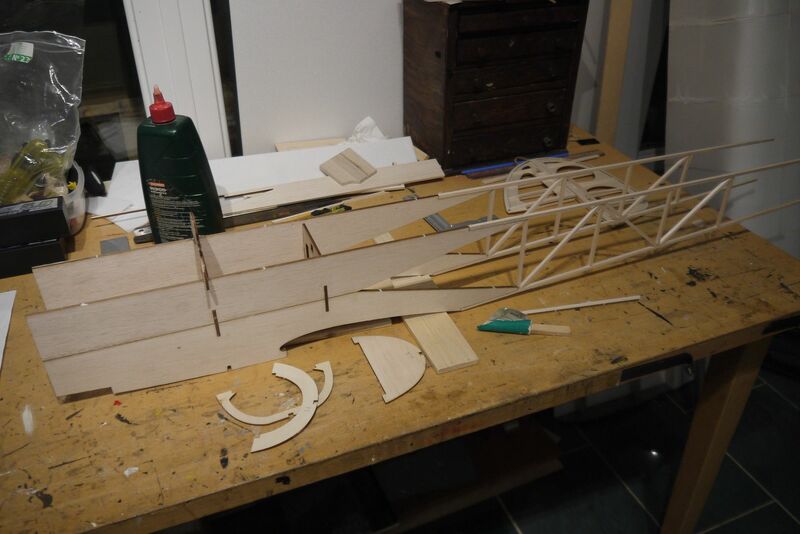 i have also started the tail plane, i am replacing so i am replacing some of the balsa ribs with depron to try and save some weight at the rear. Well done Tony looks great! today i added the top rear stringers. 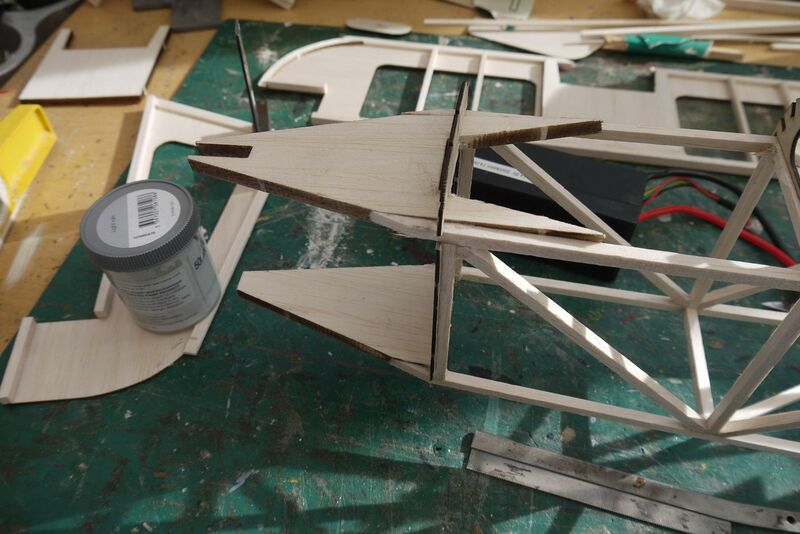 two are balsa as they have to hold the fin block, the rest are cut from depron as a weight saving exercise. 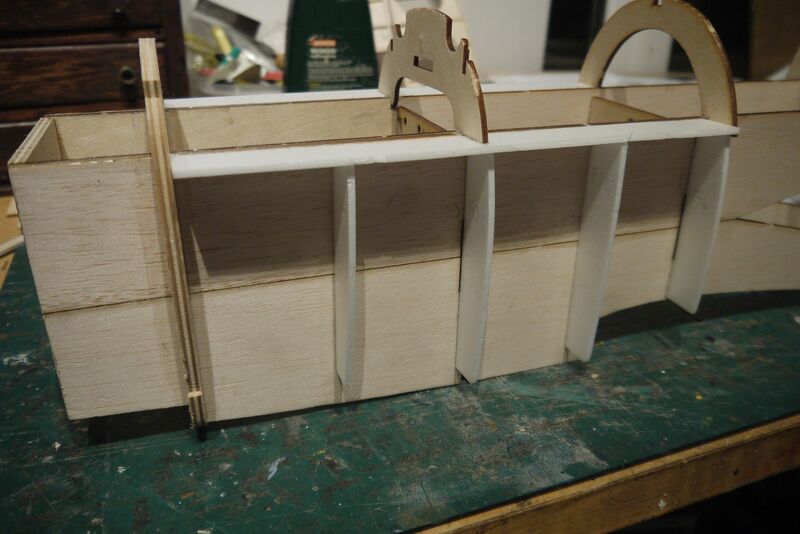 then i added the upper sheet edge to the front of the fuselage back to F2, i used 3mm Depron again. after that i tracked down and tried to work out the front side formers, the plan is a bit wonky on the former labeling. FS2 goes between F3 and F4. then there are side formers that go on F3 and F4 but these are not labelled on the plan. oh these are depron as well. now the issue i have is that FS2 is wider at the top than the F3 side former, so when i come to the final sheeting there will be a dip in the outer skin at F3. now do i trim FS2 down or pack out F3. it is confusing because of the way the fuselage plan is marked up. something to ponder overnight i think. side formers cut from depron and glued in place. FS2 needs trimming as it is too wide at the top. as you can see the right hand side is different to the left. be care full getting FS5 at the correct angle or you will get a kink in the stringers, i will be cutting new slots in mine to make sure the stringers run corectly.